Suitable for dry to very dry reactive skin. WOMAN Skincare Awards winner. Rosaliac UV Riche was awarded the prize for Best Redness Reducer. - Vitamins CG and B3 to help diffuse the onset of redness. - Mexoryl XL filtering system to help protect the skin from UV rays one of the main aggravating factors of redness. Enriched with a moisturising agent and with La Roche-Posay thermal spring water, with anti-irritant properties, to help intensely soothe the skin. Parabens free. Fragrance free. Non-comedogenic. 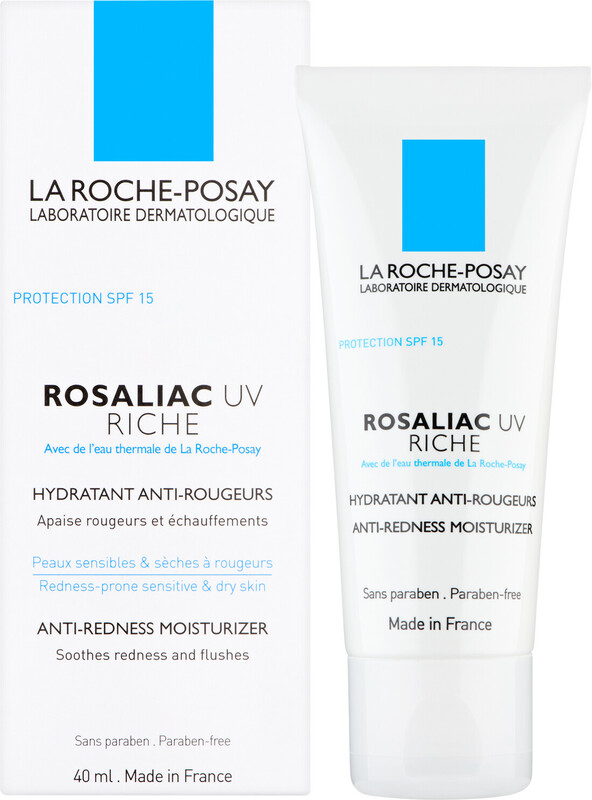 La Roche-Posay Rosaliac UV Riche Fortifying Anti-Redness Moisturizer 40ml is rated 4.2 out of 5 by 9. Rated 2 out of 5 by Tilds from Not Impressed I have acne-type rosacea and generally dry, very sensitive skin. I wish I could have tested this moisturizer before I purchased because I would likely not have ordered it. It stings my skin slightly when applying, which is troubling since this is marketed towards rosacea sufferers. The stinging stops after a few minutes and it doesn't seem to irritate my skin to the extreme (a bit of itching persists), but I am very wary of products that cause any amount of discomfort. A moisturizer for rosacea should be soothing. I also find the texture off putting as it stays quite sticky after application and doesn't sink into the skin properly. Because of these issues, it also is difficult to apply makeup over. I have tried a variety of powder and liquid concealers/foundations with it, but they all easily rub off with the moisturizer instead of blending. Very disappointed, as other La Roche Posay products I use have been great. I would not repurchase and honestly would return it if I could. Rated 5 out of 5 by Lynn777 from Wonderful product Having suffered from Rosacea for 15 years i have finally found a product that calms it down. I have spent lots of wasted money on creams that don't help but not only did this cream ease the irrition but also faded the redness . Thank goodness i found it. This product would also be good even if you don't have rosacea, just high colour or irritated skin. Brilliant! Rated 4 out of 5 by becky83 from redness relieved A tiny bit greasy but This has totally relieved my dry red sore skin in just over a week an also gave instant relief from the tightness of my skin. Will definitely buy again.